One of my 2018 goals was to be financially independent by 2032. I also started associating a number with it to track my progress. I have had few comments asking me what it means and how I came up with this number. I will try to answer those questions as a part of this post. Back when I started this blog I got exposed to FIRE (Financial Independence and Retire Early). Everyone was driving towards this goal. 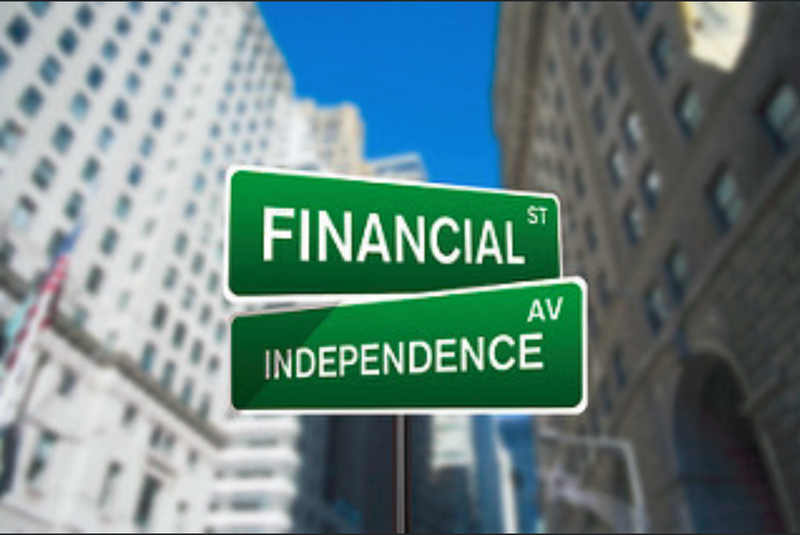 Recently, I came across this new term FIRO (Financial Independent and Retire Optional) and I am starting to think FIRO is where I want to be. Why? Because I want to be realistic! Given my age and my late start I don’t think I can FIRE by 2032. However, I have a very good chance of achieving FIRO. What is my FIRO portfolio size? It’s based of our current monthly expenses i.e. 30x our monthly expenses. I don’t have any statistics to back this up. Nevertheless, it is good starting point. To compute the projected balance in 2032, I take my current balance and compound it by a ROI %. In performing this computation I assume no further cash additions to my portfolio. Let’s say I have $10,000.00 in my portfolio today. By 2032, assuming a 7% ROI I would have $25,481.84 in my portfolio. This is a very conservative approach. My computation always assumes the worst case scenario and I like to work off that. Every additional dollar invested, dividend increase and dividend reinvestment contributes positively to my progress. My ROI assumptions are very conservative too. Unlike state pensions I tend to be very conservative in ROI assumptions. I read an article by John Bogle (Founder of Vanguard) in which he talks about the expected average return from the stock market going forward. His assessment was that the on an average the returns would yield + 2%. S&P 500 (VOO) has a yield of around 1.87%. ). So, effective ROI going forward would be 3.87%. Assuming a lower ROI places additional importance to contributions (i.e. contribute early and more). I would rather assume a lower ROI and overshoot then assuming a higher ROI and undershoot. The above table shows the importance of contribution. With increase in ROI the importance of contributions decrease and vice-versa. Put it differently, you could contribute a lot less and still achieve your goal if you assume a relatively high ROI. This is pretty much what my state does for its pension contribution (allows them to spend freely today). I have a mix of ETFs in my portfolio. My effective ROI (estimated) based on current allocation comes out to be 4.25%. Here is a concrete example putting it all together. Let’s say my goal is to have $1,000,000.00 by 2032. My portfolio as of today has $10,000 in it. Assuming 4.25% ROI my portfolio would be valued at $17,777.50 in 2032. That is 1.78% of my goal. Hopefully, this clarifies what my FIRO target is and what my % progress to FI means. When I started this dividend blog my goal was to live of dividends. I am starting to find out it is unlikely. If I want to have $50,000.0 in dividends by 2032, I need to have a portfolio of $1,689,189.19 by 2032! Assuming I invest exclusively in Vanguard High Dividend Yield ETF (Yield: 2.96%). VYM is one of the highest yielding equity ETF in Vanguard. That comes out to be $85,000 per year in new investments for the next 14 years! There are three favorable events which can get me closer (1) dividend increases from stocks, (2) buying stocks at discount during correction and (3) higher returns from the stock market. First two events would increase my yield and in the process increase my income. (3) Would increase my portfolio value and I can start selling some of my gains during retirement. Unfortunately, (3) contradicts (1) & (2). This is primarily the reason I switched from FIRE to FIRO. True. FIRO is a good choice. FIRO is definitely the way to go although the definition of retiring early is murky. I'd still definitely want to do some sort of work when I'm FI, probably something different than what I'm doing now thought. Yes! Something we would like doing. I do love my job. But, I would also like to contribute to society. Geek, I agree. I think the key thing we work towards is options. It is much easier to go to work when you know you don't have to. Having some sort of financial backing will allow us to decide what exactly we WANT to do with our time. Totally makes sense. I would also like to add that FIRE might not always be possible for everyone. In my case FIRO is the option I have. Hey DG great post. I think depending on your age, FIRO is the way to go. It is really nice having options and being able to do what you want while still having stuff to keep you busy. The added cushion of passive income is always good. That's where I want to be :-) Thanks Steve. I quite like the idea of FIRO over FIRE as well. I wouldn't like to completely retire, especially if I like what I do. But maybe trying to work less and play more golf is the way to go. :-) You should aim for FIRE. FIRE has more requirements than FIRO. Then you get to pick between FIRE/FIRO. Nice. Like you i prefer firo. Retire early is nice but maybe ill get bored. If i worked a couple hours a day just to get out and do something why not? For sure. I will probably get bored sitting at home. Teaching is something I want to get into. Math is my favorite subject. I like you prefer Firo, Me too. I am also wanting to choose Firo over Fire. Good to know we are on same boat for a long haul. However, I do think 7% ROI is not very conservative, that's pretty much right on money if not bit aggressive, to me. At least my ROI is never been that high so may be for me that doesnt work well but I hope your's perform better :). Thanks TDK. My ROI is conservative at 4.25%. I was just mentioning that I would never assume such a high ROI while computing retirement income. But, a lot of states do that for their pension plans. I didn't know the difference between FIRO and FIRE before. Sounds interesting to not need to work but yet being optional. It seems to me that 7% annual ROI is a bit too optimistic. With the current bull market, it seems quite right, but over the next 14 years, it seems a bit high. Thanks TPS. My assumption is conservative its 4.25% on an average. It is also function of the overall portfolio yield. If the market keeps going and yield goes down ... my ROI goes down. IMO 7% is over aggressive. I'm also for FIRO. Working on my terms and also supplementing with passive income sounds good to me. I don't think I'd have enough passive income to live off anytime soon. Yes! I want the luxury of passive income. But, I can do what I want to do .. i.e. teach. I agree with your assessment ....living of passive income is a dream for now. I don't want to ever fully retire. I could def see exiting the corporate world though. Love your new ticker countdown to FI! Thanks DM. To me FIRO is the only option. I wish I had started earlier. But, I would probably be bored sitting at home. Did I actually start something?? Can any of you let me know if you saw FIRO anywhere else before I started using it? That would be so cool! I think it is pretty cool if I did:) I never started a trend before!!! FIRO sounds like the way to go DivGeek. Work is a great thing, but having a few more options with the work you choose to do is most important. I generally feel that if your only goal is FI, you should probably focus on making some other changes in your life today first, while you can - unless you're so stuck in a bad situation that FI is the only way to escape! Also depends on the practical aspects of how you want to live your life, whether going hell-for-leather after FI is worth the sacrifice today. Always good to reflect and reassess! Very well put Frankie. Decisions are not cast in stone. With FIRO I am hoping to work lot more on things I like to do. These jobs might not pay me as well. Fortunately, I am very happy with my job now. I love math.